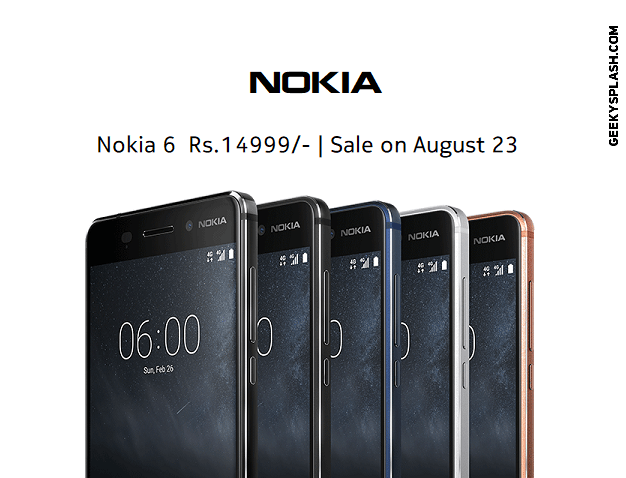 The most awaited Nokia’s new mobile Nokia 6 is all set go for sale on August 23rd in India after the Chinese and USA debuts! Nokia which sold its mobile hardware division to Microsoft in 2011 after failing the race with Android devices, announced it will return with Android mobiles in partnership with HMD Global. They announced 4 models – the indestructible Nokia 3310, Nokia 3, Nokia 5 and the Nokia 6. In India Nokia 3310 was launched a few weeks ago, followed by Nokia 3 both via offline mediums. The remaining two handsets Nokia 5 and Nokia 6 are yet to reach the Indian Market. HMD Global recently briefed to NokiaPowerUser that the Nokia 5 and Nokia 6 will be open to sale in India in mid-August and they start manufacturing the devices in this week. It is a fact that the response for Nokia 6 has exceeded the expectations of HMD Global. Today Amazon.in kept a banner on its website to register for the sale on August 23rd. Here is the link in case you want to register – Nokia 6 on Amazon.in. Nokia 5 is likely to be available via offline unlike the Nokia 6. As we know Nokia 6 is priced at Rs.14,999/-. You must register for the sale if you want to buy, that’s mandatory. Amazon.in is offering cashback for its Prime Customers. If you’re just an Amazon Prime Customer and you buy the mobile, you’ll get Rs.500 cashback and if you’re an Amazon Prime Customer and Pay with Amazon Pay, you’ll get Rs.1000 cashback. Yeah, in case you are not Amazon Prime customer, you won’t be getting the cashback. There are options to try Prime and stuff which you may be wondering, but the cashback you’ll get will be actually credited after 30 days or so. So even if you try to return the product, you may not be able to get cashback. You can read more here. I predict there will be a huge demand for these mobiles though they are not aggressively buffed up with high-end specifications. Nokia claims it as premium mobile and its experience is to be considered. Excluding the Xiaomi and other Chinese brands, Nokia 6 is still a good deal and also getting good reviews about Chinese and USA versions ( USA version is a little pricey). Previous article WD Blue 250GB SSD Review – Blazing Fast!